so a small write up from me depicting my childhood celebrations of this most awaited festival..I am sure all my friends would relate to this. Pardon my lingo for today…I will be typing few words in Tamil,Telugu, Marathi and Kannada. My very own South Indian integration!! I am proud to be a Banglorean wherein one gets used to hear all languages being spoken. It’s the Ganapati season and I am missing the celebrations at my hometown or should I say the most happening place for me in the world, my dear dear dear Bengaluru!!! 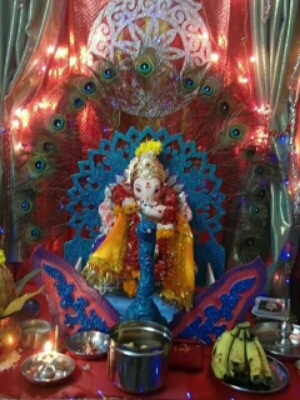 So coming back to our friend, our saviour and the beginner of all auspicious things, our lovely, chubby, elephant headed God, in a cute attire, balancing Modaks( also called Kozhukattai in Tamil) visiting our houses according to the mythology and the tradition of bringing in a statue of the Lord and celebrating his birthday. 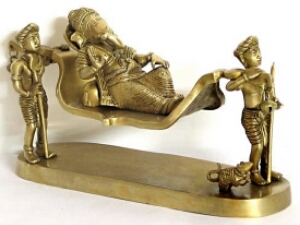 I won’t go into the details of the exact origin and the importance of this festival, just want to emphasize how important the birthday of this Ekadanta (Single tusked), Skandapurvaja (Elder brother of Lord Karthikeya), Parvathi Putra, Varasidhhi Vinayaka (Bestower of boons and success) is to us. I have grown up seeing the celebrations in my city and in the southern parts of India and once had the opportunity of witnessing the pompous celebrations in Mumbai, where the Lords birthday is the most important thing for any Mumbaikar akin to the way the Lord’s mother, the Goddess Durga is worshipped and celebrated in Kolkata as Durga puja. The celebrations would begin much before the actual festival, in the form of cleaning the puja room and the murtis (idols) of the gods and the goddesses and the preparation of mouth watering savouries… aahhhaaaaaa the crispy murukkus..the sweet tasting adhirasams,the kajjikaais and laddoos specially made out of rava….the list is endless. A traditional, bigguhhh Kolam (rangoli) sometimes with a small Ganesha picture in the centre or with wishes of Happy Ganesh Chaturthi writings would be drawn out with expertise. We would quickly go about choosing one idol of the Lord and bringing him home. Mummy and granny would be waiting having kept the prasadams ready. The Lord would then be seated in a special place made for him similar to the Crib made for Lord Jesus Christ, sometimes on a larger scale as seen in a pandal specially erected for the Lord. The puja would begin, normally done by the elders or at times a priest would be called to conduct the rituals. The entire house would be filled with religious chants, the most famous shlokam being “Shuklam baradharam” amidst the ringing of bells and the sweet smelling fragrant agarbattis and dhoop sticks. 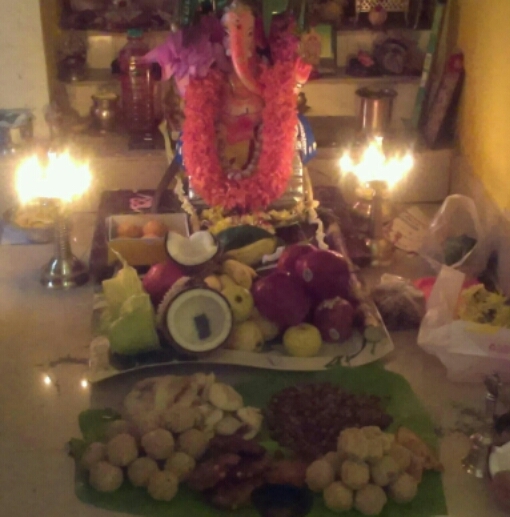 Each item would then be placed in a special plate adorned with a banana leaf in small small quantities and offered to the Lord..The lucky God, who gets to taste all those yummy foods would then be invited to our houses with a song and an aarti. Mummy would then help us arrange our school books in front of the Lord and apply Kum kum to the them and place flowers and worship the books. We would be given prasadam from the Lords offerings and then plates would be arranged with all the savouries accompanied by fruits and sweets and then we children would be given the task of running off to our neighbours houses with the mouth watering delicacies to distribute them. The neighbour aunty would then give each of us a Kozhukattai /modaks and we would run off to catch a glimpse of the Ganesha decorations at their home and go home with plates filled with the return sweets. Once this was completed and all the neighbours houses covered, we would go with our friends to visit the nearby pandals and see the idols decorations, running back home in time for the special lunch. 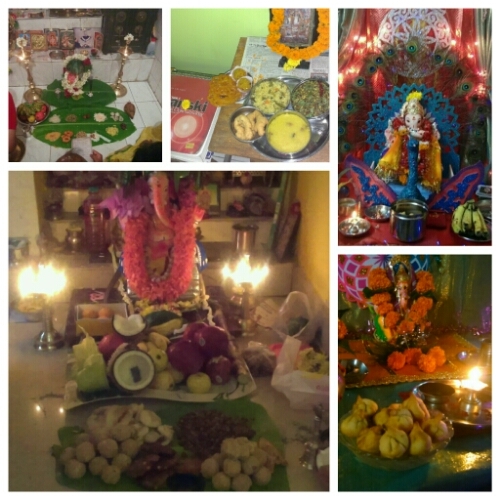 Our already filled tummies would try to stuff in more of the food…and end up like mini Ganeshas, followed by an afternoon seista for the elders but never ending chatter and games for us children and stories told by granny about the origin of this festival. 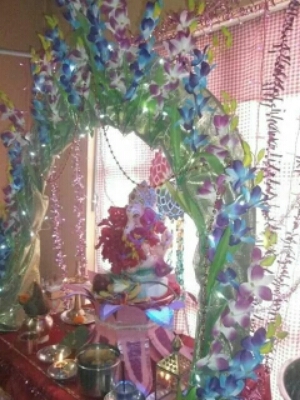 The evening aarti would be carried out and the Ganesha idol taken for immersion, the Ganesha normally is kept in houses sometimes for a week or in huge pandals it’s usually a few days. It was told to us that the number of days you keep the idol at home, the Lord should be treated with delicious prasadam or offerings and tasty treats of some kind as it is not good to keep the Lord hungry. The Lord would be then be immersed the same day or the next day after the puja. There is a famous spot in Bangalore called Ulsoor lake…with hundreds and hundreds of people going in to immerse the Lord and praying to the Lord to visit us again next year, knowing that the Lord is ever prevalent and with us always and thus we always evoke the friendly elephant Lord and seek his blessings at the beginning of all occasions…hence rightly said…. nice way to start off neethu “a small write up”, never thought it would be sooooo small. yeah thanks for making me feel at home while reading ur small write up on all the best times of ganesha festival, even I had all those similar moments. u named all the yummy dishes n now am wondering how on this desert can I find atleast one off those, kosambari n kozhukattai(ummmmm) tats my fav fav. keep up the good work neethu n I hope n request u to make me feel at home for deepavali(diwali) through ur blog for the lights. Wow, what a great memory for you to share. It must have been truly magical as a small child to witness such a colourful event. All of it sounds so beautiful (apart from the cow pooh on your doorstep….!) and evokes such wonderful imagery. 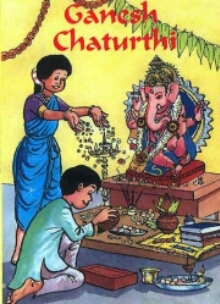 Helloooo… Thanku for the kind words.. Means a lot..😃 Yes indeed Ganesha chathurthi is the most widely celebrated festival in India.. And it’s a memory etched out in all our young minds.. The cow poop ha ha ha can’t help it.. 😂It’s a custom here in villages especially, as it’s auspicious (though nowadays it’s rare)… thanks again for the wonderful comment.. Keep Posting..
hahaha i was looking for gallivanting too it’s such a lovely word!!! Do you still celebrate it like this? Gosh I really would like some prasadam now..